Odontogenic tumors (OTs) are lesions derived from epithelial, ectomesenchymal or both the elements that have been part of the tooth-forming apparatus., Odontogenic cysts are the most common type of cysts occurring within the jaws. They arise as a result of proliferation and cystic degeneration of odontogenic epithelial rests. OTs and cyst are uncommon lesions accounting for <2–3% of all oral and maxillofacial specimens sent for diagnosis to oral pathology services. If viewed as a percentage of all tumors in the human body, this figure is reduced to a conservative estimate of approximately 0.002–0.003%. More than 95% of all OTs reported in large series are benign and around 75% are represented by odontomas, ameloblastomas and myxomas. The earliest journal report of an OT was published in 1839 which was a bony hard lesion of the maxillary bicuspid region that in today's terminology would be diagnosed as cementoblastoma. A complex odontoma was reported in the American Journal of Dental Science in 1848. It was, however, the renowned French Dentist, the founder of modern dentistry, Pierre Fauchard, who in 1746 provided the first accurate description of an odontoma. In 1869, the French physician and professor of Pathology and Clinical Surgery, Pierre Paul Broca produced a monograph on tumor classification which also included the classification of OTs. Bland-Sutton's contribution in 1888 lay down to what could be called modern OT taxonomy by basing his classification upon the nature of the particular cells of the tooth germ from which the tumor arose. They included odontogenic cysts and fibrous osteogenic tumors in his classification, but the term odontoma remained as the common designation for any tumor of odontogenic origin. In 1930, Ivy and Churchill introduced the term ameloblastoma. The connective tissue odontomes become fibromas or cementomas according to their structure. Thoma and Goldman in 1946 modified the classification introduced by Bland-Sutton in 1888. They considered enamel pearls as developmental malformations rather than neoplasms. Pindborg and Clausen in 1958 suggested OT to be a result of epithelial-mesenchymal interaction with cellular changes in tumor pathogenesis. On this basis, tumors were divided into two main groups: epithelial and mesodermal. Composed of epithelial tumors that do show inductive changes in the mesenchyme. These tumors comprise a soft tissue type and those characterized by the occurrence of hard dental tissue, dentinomas and odontomas. Mesodermal tumors covered include odontogenic fibroma (fibrosarcoma), odontogenic myxoma and cementifying fibroma. Twenty-one years later, in 1992, a second edition: “histological typing of OTs” appeared. In this second edition, the benign category is subdivided into three groups: lesions in which there is odontogenic epithelium without (morphologically identifiable) odontogenic ectomesenchyme; lesions in which both of these elements are identifiable (some lesions in this group show inductive changes leading to the formation of one or more of the dental hard tissue) and lesions in which odontogenic ectomesenchyme appears to predominate; although in some instances, odontogenic epithelium may be included. There are also substantial changes in section on ameloblastomas, while some lesions designated in the first edition have been moved to another part of the classification or merged into different subgroups. New variants described in this classification include desmoplastic ameloblastoma and keratoameloblastoma. In the year 2000, the International Agency for Research on Cancer (IRAC) in Lyon, France, started a series on the WHO classification of tumors. In the early 2002, Philipsen and Reichart updated a revision of the second classification. Advances made in this new classification were origin of the tumor and interactions of odontogenic tissues in tumor development. This classification was based on the biological behavior of the lesion, where the lesions were categorized into benign, malignant and non-neoplastic. The classification approved at the Editorial and Consensus Conference held in Lyon, France (WHO/IRAC) in July 2003 in conjunction with the preparation of the new WHO blue book and genetics of tumors of head and neck is shown in [Table 1]. Ameloblastic fibrodentino sarcoma and fibro-odonto sarcoma. An important aspect associated with the first group of tumors lies in the characteristics of the tumor stroma. The stroma is relatively acellular and fibrous in contrast to other groups where the stroma is ectomesenchymal in nature. Odontogenic fibroma represents a rare and controversial tumor. At present, two variants can be distinguished: the epithelium – poor type and the epithelium – rich type, formerly known as simple and complex (or WHO) types, respectively. A wealth of clinical and molecular evidence has indicated that the odontogenic keratocyst (OKC) has been regarded as a benign cystic neoplasm. OKC is now termed as keratinizing cystic OT due to its aggressive nature and high recurrence rate and has been included under benign tumors arising from odontogenic epithelium without ectomesenchyme. Similarly, calcifying odontogenic cyst has been renamed as “calcifying cystic odontogenic tumor (CCOT)” and has been included under the category of OTs arising from both odontogenic epithelium and ectomesenchyme. CCOT is characterized histologically by the presence of ameloblastoma-like epithelium along with ghost cells and areas of calcifications. A new lesion has been described in this latest classification called as dentinogenic ghost cell tumor (DGCT), which was formerly considered to be a solid variant of calcifying odontogenic cyst. DGCT is difficult to differentiate from CCOT. Malignant transformation of DGCT into dentinogenic ghost cell carcinoma has been described. The current WHO classification of OTs is based on the behavior of the lesion. Although OKC and calcifying odontogenic cyst are considered to be benign cystic neoplasms in this classification, many authors are reluctant to agree on this notion. The reason behind this reluctance is that not all the OKCs and COCs behave aggressively similar to a neoplasm. Further, there are a few lesions which histologically show the proliferation of odontogenic epithelium, but the pattern does not fit into the diagnostic criteria of any of the above-mentioned odontogenic neoplasms. Hence, a revised classification of odontogenic cysts and tumors that would incorporate the molecular pathology of the lesion has become mandatory. The classification schemes and terminologies used to describe odontogenic lesions have undergone various modifications since 1971 when the WHO published the initial consensus on the taxonomy of OTs. Minor changes were introduced in the second edition in 1992. It is only in the very recent years the additional knowledge has accumulated that resulted in refining the classification of both benign and malignant OTs. Changes in the classification help us to understand not only the pathogenesis of the tumor but also to determine the behavior and prognosis of the tumor. Philipsen HP, Reichart PA. 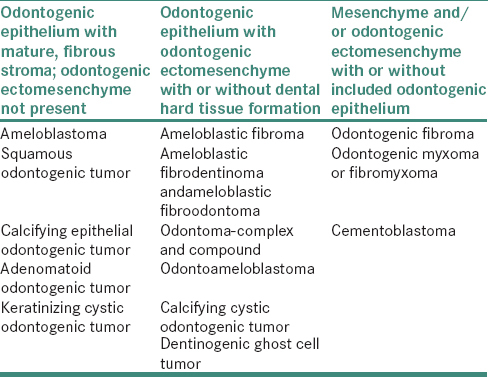 Classification of odontogenic tumor. A historical review. J Oral Pathol Med 2006;35:525-9. Kramer IR, Pindborg JJ, Shear M. The WHO histological typing of odontogenic tumor. A commentary on the second edition. Cancer 1992;70:2988-94. Shear M. Cysts of the Oral Region. 4th ed. United Kingdom: Wiley; 2007. p. 82. Philipsen HP, Reichart PA. Revision of the 1992-edition of the WHO histological typing of odontogenic tumor. A suggestion. J Oral Pathol Med 2002;31:253-8. Reichart PA, Philipsen HA. Odontogenic Tumors and Allied Lesions. London: Quintessence; 2004. P.18. Main DM. Epithelial jaw cysts: 10 years of the WHO classification. J Oral Pathol 1985;14:1-7. Kramer IR, Pindborg J, Shear M. The World Health Organization histological typing of odontogenic tumors. Introducing the second edition. Oral Oncol 1993;29B:169-71. Shear M. The aggressive nature of the odontogenic keratocyst: Is it a benign cystic neoplasm? Part 1. Clinical and early experimental evidence of aggressive behaviour. Oral Oncol 2002;38:219-26.